Thursday, Oct. 4, 2018, 12:30 – 1:20 p.m.
Alan Kolok’s background features a doctorate in environmental, population and organismic biology from the University of Colorado, and a master’s degree in fisheries and aquatic science from the University of Washington. He has published 70 papers and conducted extramurally funded research across a wide variety of topics, including: comparative physiology, environmental toxicology, environmental epidemiology and the crowdsourced data revolution. In these research efforts, he has worked and published with scores of undergraduate and graduate students. 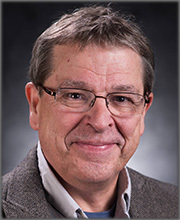 Kolok is an editor for the journal, Environmental Toxicology and Chemistry, and recently authored, “Modern Poisons: A Brief Introduction to Contemporary Toxicology”. He is in the process of publishing his second book “Twist”, a science fiction novel in which prions go terribly wrong.